Prices remained under pressure on the cotton market on Monday in arrivals of seed cotton improved in the process of trading, dealers said. The official spot rate continued falling trend, losing more Rs 200 to Rs 6,200, dealers said. 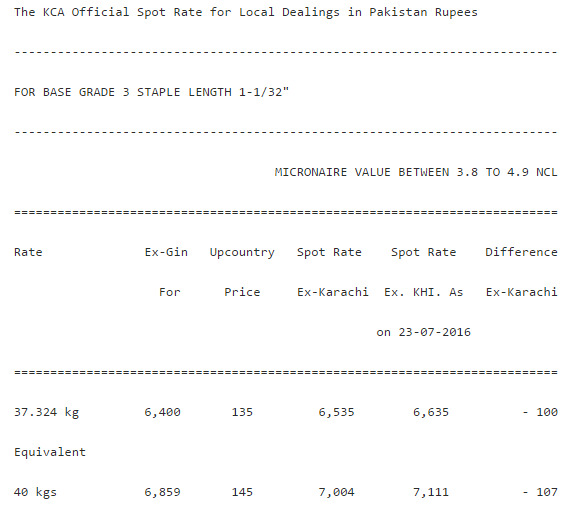 In both Sindh and Punjab, seed cotton prices were at Rs 3000 and Rs 3200 per 40 kg, respectively, they said. In ready business, around 20,000 bales of cotton changed hands between Rs 6400 and Rs 6500, they said. Market sources said that it is very interesting to note that prices are not showing improvement, instead of falling despite strong mills’ buying. Cotton analyst, Naseem Usman said that it is not easy to predict that how much prices can fall in the coming days. According to Reuters, heavy rain in Mali’s cotton-growing regions could help the country to reach its production target of 650,000 tonnes despite a dry start to the season, the state-owned Malian Company for Textile Development (CMDT) said. The following deals were reported: 3000 bales from Mirpurkhas at Rs 6400-6500, 3000 bales from Shahdadpur at Rs 6400-6500, 3000 bales from Sanghar at Rs 6400-6500, 2400 bales from Tando Adam at Rs 6425-6500, 1200 bales from Hala at Rs 6425-6500, 2000 bales from Hyderabad at Rs 6450-6500, 1000 bales from Kotri at Rs 6450-6500 and 800 from Moro at Rs 6450-6500, dealers said.